"We haven't gone into the jungle in years." "No. I can't. It's too dangerous." "So what if there's Evobars? They're expensive... sure... but..."
"Okay. I'll go get the rest of the organization. Please wait here." Your Pixpet is a part of the 'HPA,' or the Hoarding Pixpets Association. You are one of the lucky few that have made it this far; congratulations. Only one from each species is allowed to enter. These elite are sent to hoard where it is much more dangerous... and reap amazing rewards. The biggest reward is an incredible amount of riches in the Izzet Jungle. Nobody has ever come back out of there alive. Now, it's your turn to join. Come into the Izzet Jungle with the most elite of the rest. Work together to come out alive. 1. All Pixpet Rules apply. 2. This is a semi-literate RP. When making replies, use AT LEAST 3 SENTENCES, please. If you are only comfortable with literate, you are OK to do that as well. Just do not expect such long replies in return. 3. You may have up to 2 Pixpet Characters, until more Pixpets are added. There's not 800 like in Pokemon. 4. You may give your character minor mutations, but nothing crazy. For example, you can't make a Sunobra/Xeldron fusion, but you can recolor the Sunobra if you wish; or give it some kind of split tail. 5. Don't be too OP. If harm is supposed to be done to you / if it seems logical, take the damage. 6. You can't kill off someone else's character without their consent. 7. LGBTQ+ is always allowed, as is romance. Don't take it too far, though, please. 8. Slight gore is also allowed. As said in Rule 7, just don't take it too far. 9. You must use the form to sign up your character. Not using the form will result in no character at all. More rules may be added in the future. Character Name: What is the name of your brave Pixpet willing to venture off into the jungle? Age: Your Pixpet must be at least 18 moons old (18 months old) to join the HPA. Gender: They can be a guy or a girl. However, please check the 'Pixdex' before choosing this. Some Pixpets can't have genders. Sexuality: If you don't want your character involved in romance, just put 'Asexual'. Species: What species is your bizarre little Pixpet? Appearance: What does your Pixpet look like? If they look just like a normal Pixpet, you may feel free to put that. Other: Anything else you might like to add? We are now open for members of the HPA. We will begin the RP when we reach 5 Characters. &commat;Chicago of course you may. Reservations have been made. &commat;cynderplayer you don't have to be too experienced to join! You do what you want to do; I can't force you to join or anything. Could I please reserve Troffinch? I'd like to join, though I don't have much prior experience. I'll be filling out the form when I have the time. could you reserve Canisqua for me? Both Pixpets have been reserved. Thank you both for wanting to join! &commat;RedFeatheredReptile of course you can reserve Noo-Long! I'll add you to the reservations list! On 1/25/2019, I am pinging everyone who has reserved to get their forms in! Can I reserve the Albino Xeldron? I’ll fill out the form as soon as possible. &commat;DraconicMusic Yes you can, thank you for joining. Here’s my character form for the roleplay. Personality: Silver is a calm individual who is a pacifist at heart, but they can be brave and serious when prompted. When talking things out isn’t an option, they don’t hesitate to fight. And despite their imposing stature, they have a big heart and the capacity to care for others. Backstory: Silver was found as an egg by an Indigoat while they were out on a hoard and was brought back to the Indigoat’s owner. When Silver hatched, they helped out often around their owner’s house and went hoarding often with their adoptive Indigoat father. But when they heard news about the HPA, they decided to sign up for the association, despite many not coming back alive from the jungle. They are determined to find what treasure lies within the jungle. Appearance: Looks like a typical Albino Xeldron, but with some silver stripes on their back and tail. Their eyes are a bright blue. - Their voice would sound similar to the character X from the video game Mega Man: Maverick Hunter X. - Their sexuality is actually pansexual, but is asexual simply for this roleplay. Personality: Takeru is generally very friendly towards others, even tho he can be quite shy at first. He has a tendency to get very excited about certain things he likes. Occasionally, Takeru lacks confidence in himself. While he usually is very nice, once stressed enough he might become aggressive and lash out on people. Backstory: When Takeru was very young he got taken away from his owners and family, and forced to participate in illegal pit fights. Losing meant electrocution, and no food for the rest of the day. This understandably caused him plenty of trauma which he still need to deal with to this day. His nightmares are a constant reminder of the event. After six months of hell, the authorities finally found out about the arena and shut the businesses down, which led to all the captured pixpets being set free. Sadly hell was not over for him yet, as it turned out that his parents had died while trying to find him, leaving just him and his old owners. The loss of his family hit him hard and as a result he fell into deep depression, shutting himself away from the rest of the world. He just recently managed to break the downward spiral thanks to the help of a very special Sunobra called Flame, who lost his home. They quickly became close friends and Takeru promised himself that he would help flame no matter what. In an attempt to figure out what happened to Flame's home, both of them traveled far and wide. However wherever they went, it was always a dead end. With very few leads left Takeru decided to brave the Izzet Jungle. He knew it meant going without his companion, as Flame would not be strong enough. Takeru will be strong for both of them, or at lest attempt to be. 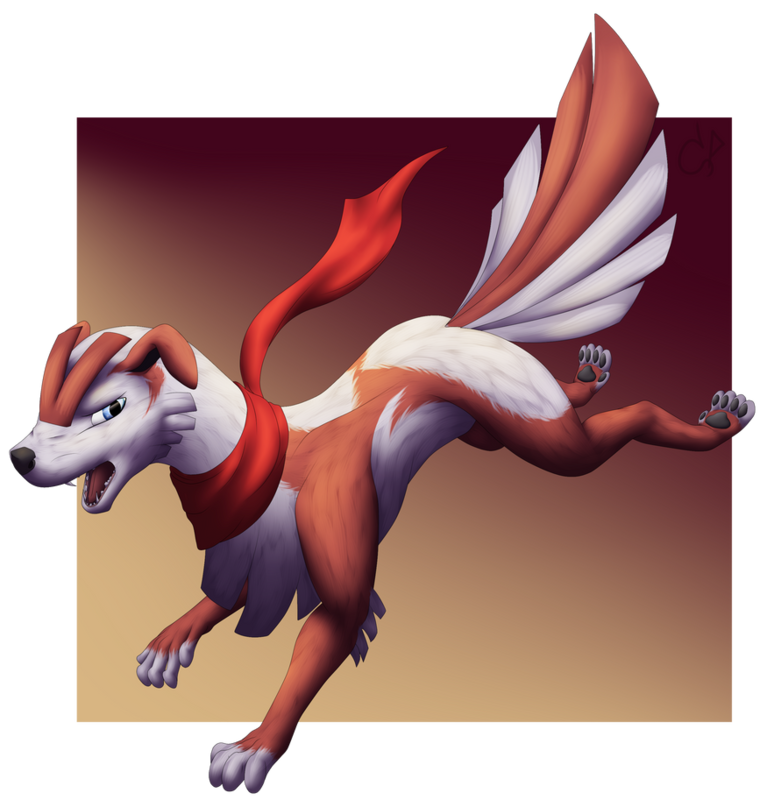 Appearance: Takeru's angular fur has a pale white color to it, while the rest of hes fur has a red color similar to that of a Luputrix. He also wears a red scarf around his neck at all times to cover up the scar left by the shock collar worn during his time in the arena. His eyes are light blue. Other: Takeru is quite superstitious, and such believes wholeheartedly in ghosts and other supernatural things. He has quite a fear of ghosts. While he is good at fighting and physical activities, he is pretty bad at a lot of other things. (Annnnnnnnnd there we go. I ended up shortening the backstory quite a bit as i thought it was long enough already. I have to many ideas in my head. &commat;cynderplayer I like your form, the story is great. You're approved! If you want I can make Flame; I've got Sunobra as one of my two reserved.